Another bank holiday weekend arrived which means another two day mini festival at Summerhayes and Ray Wickham was my partner again. There were a few more fishing today which meant one of us would be Longs and the other on Sellicks and then vice versa on day two. As soon as I arrived I went to pick up a couple of nets and could see loads of carp spawning in both lakes and I wasn’t sure how it would affect the skimmer fishing. I did think that perhaps if the carp had their minds on other things, they wouldn’t give us silvers anglers too much trouble. Pete had decided to run a super pool over both days, one for carp and one for silvers, which I think is a great idea as it gives you something to fish for if you blow out. Pete announced the first draw which would decide which lake we’d be on and I ended up on Longs and just needed to avoid the carp pegs now. When it was my turn I stuck my hand in the bucket and pulled out peg 13 which I was fairly happy with as it’s normally a steady silvers peg. 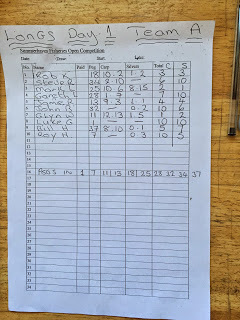 I had Glynn for company on peg 11 which is a great silvers peg and Glynn, me, Charlie Barnes and his partner John all stuck a pound in the pot and the top silvers weight would take the £4 and Rob Kingston was on peg 18 and wanted a pound side bet and Mark Cox also wanted a nugget on silvers. I had high hopes for peg 13 before the start! Bait for today was some Bait Tech Special ‘G’ Gold groundbait, micros and 4mm and 6mm expanders for the hook. I set up two rigs, a 10 x 11 MW F1 Slim for the 10 metre lines and a 0.2 gram NG Mini Gimp for the 5 metre line, both had 0.10mm hooklengths and size 16 Tubertini 808’s. I was just about ready in time and on the whistle cupped in half a pot of micros on the 5 metre and right hand 10 metre lines and then two balls of groundbait on the left hand 10 metre line. I started with a 4mm expander over the micros and was expecting to get indications quite quickly but with no bites after ten minutes I was a little concerned. I moved to the other longer line and finally had a bite over the groundbait only to bump a small fish and after an hour I was still blanking! Nobody seemed to be catching and this looked like it was going to be rock hard, Glynn caught a carp and then had a small skimmer which he’d foulhooked. 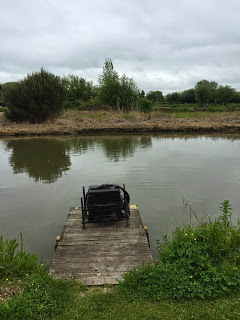 There were carp spawning everywhere in the nearside margins and all along the far bank so maybe that had something to do with how poorly it was fishing. I did foulhook a 3lb carp from the right hand line but as the halfway point of the match loomed into view, that was the only fish I’d had and I wasn’t enjoying myself very much! 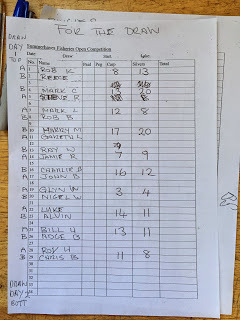 Rob was in the same boat as me and hadn’t seen a silverfish yet and Glynn and Roy Hughes in peg 7 had a small fish apiece – not good! To top things off a fine, misty rain started coming down, the temperature dropped a couple of degrees and I had to put my waterproofs on. I just didn’t know what to do next and I was fishing the left hand line when out of the blue the float sailed away and the strike resulted in a decent skimmer leaping out of the water. I shipped back very gently, praying it would stay on and slipped the net under a pound skimmer, it was probably the ugliest skimbob I’ve ever caught with no tail and rotted fins but at that moment I could have kissed it! 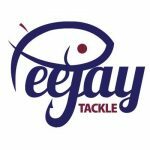 Young Reece came for a walk from his peg on Sellicks and reported it was a real struggle on there as well but Ray had caught a couple of eels so was doing okay. Out of desperation Glynn was now fishing the far bank trying to catch some small rudd, he had a couple but was hooking more carp than anything else. With two hours to go I came back on the shorter line and started getting the off indication before catching a small blade, two carp followed in quick succession (one of which was foulhooked under the chin) and even though I was still really struggling I was ahead of those around me. With an hour to go I looked up to see Rob netting a decent skimmer and I needed another fish from somewhere but time was running out. I was back on the five metre line when I noticed Glynn strike into a decent fish and straight away he said he thought it was an eel and sure enough it was a decent one of a pound or so and he’d gone ahead of me as well. 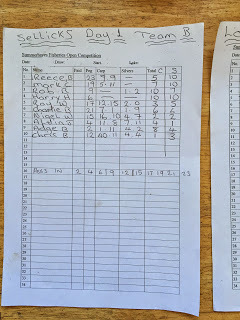 I missed a couple of bites on the shorter line and bumped a fish and that was the end of that, I’d never known the venue to fish as hard as that, even in the depths of winter! I took my kit back to the car and the scales arrived after already weighing in Sellicks where Chris B had the top carp weight with 40lb 11oz from peg 12 and Alvin Jones only needed 7lb 11oz to top the silvers from peg 15. Mark Cox didn’t catch any silvers so handed me a nice shiny nugget. Ray’s two eels weighed 2lb to put him fifth on the lake for silvers and he had 12lb 15oz of carp which was third. First to weigh on our lake was Bill ‘The Paste’ Hopping and he had 8lb 10oz of carp and 1oz of silvers and then Luke G in peg 1 blanked and Roy in peg 7 had 3oz so it had been really hard going. Glynn had 12lb 13oz of carp and 1lb 5oz of silvers to go into the lead on both fronts before my three carp went 9lb 3oz and my two silvers went 1lb 1oz, Rob had 10lb 2oz of carp and then his skimmer weighed 1lb 2oz to take a nugget off me and push me down a place. 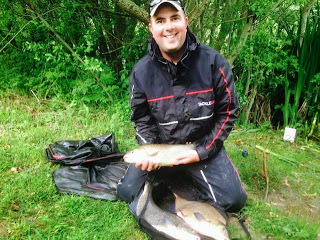 Mark Leahy had 10lb 6oz of carp and 8lb 15oz of silvers and I was rapidly slipping down the table. Gareth L had a small carp of 1lb 7oz and then John B in peg 32 had 2oz of silvers and Steve R in peg 34 had 2lb 10oz of carp and it had been really hard going for everyone today. So it hadn’t been a complete disaster for Ray and me, we go into day two lying second in the carp with 7 points and fourth in the silvers with 9 points. Glynn and Nigel are leading both with 3 points for carp and 4 for silvers and with no double bubble it will be interesting to see which way they go although I’m guessing a lot will depend on the draw. On the other side bet front, Charlie Barnes only needed a single skimmer of 1lb 9oz to win the £4 pot. 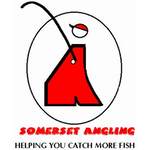 I can’t go without mentioning the Ilminster AA match at Dillington today, Tackleuk’s Ashley Tomkins had a fantastic day’s fishing and set a new match record in the process, he had six bream for nearly 30lb, a 3lb chub and 15lb of quality roach for a staggering 48lb 2oz, what a cracking weight. I saw him Saturday fishing a Newton Abbot Open Match and he was quite complimentary about you. No surprise he blew out in the comp from a flyer peg.